Since I last posted here I have been busy with – I’m trying not to say bogged down in – editing, illness, and family stuff. But one lovely and exciting preoccupation has been the arrival of a brand-new person in our extended family, which gives me the perfect excuse to take a good look at board books for babies and what is out there right now. I’ve decided to build her a library one book a week (can I restrict myself just to this??) and we are kicking off with an old favourite of mine. I think this is a favourite of the whole world! 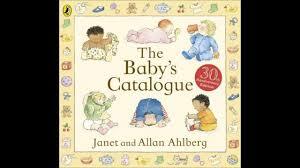 The Baby’s Catalogue by Janet and Allan Ahlberg. The Ahlbergs created such endearing classics as Peepo, The Jolly Postman, and Each Peach Pear Plum. I had the paperback version for my own kids and have now bought the sturdy board book. The only problem with this new version is that some of the pages are hard to separate and at first I feared they had left out my favourite page – Accidents! As a once undersized and very skinny small child I can painfully identify with the toddler who is slipping down inside the seat of the big loo. 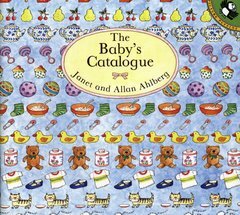 Based on the way that babies love poring over the detailed pages of catalogues, the inimitable Ahlbergs created one of their own of particular interest to tinies. The pages are filled with rows or panels of familiar things – mums and dads, pets, cups, toys, prams, swings, brothers and sisters, and babies, babies, babies. It is fairly diverse and beautifully domestic. Mums breast- and bottle-feed. Dads do caring and chores. Babies laugh and cry and look perplexed and have small adventures. There are lots of opportunities for pointing, naming, and commenting without any narrative line so it’s great for babies who aren’t ready for a story yet. 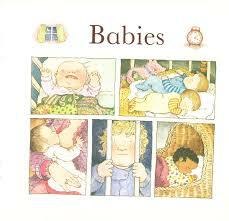 But it has the Ahlbergs’ gentle humour and fine observation throughout to keep adults going. This book first came out in 1982 and I was amazed to see that the tweedy & beardy dads depicted on some pages are bang on trend again! Maybe non-traditional families were not so frequent at this time and some items (e.g. the telly and the phone and the line full of terry nappies) have dated, but there is so much that is timeless. And the general idea that life is bit different from family to family, with different choices made, but also reassuringly similar, is a lovely one. It kind of says “No pressure”. Our old paperback got a great deal of traffic which meant the pages were bent and a bit sticky. This wipe-able board book version should hold up better. But I’m sure will be equally well-loved. There’s that lovely mix of wit and observation that works for the adults reading these books with kids – so everyone’s happy. Loved Burglar Bill – and wasn’t there Mrs Wobble The Waitress and whole series of little books too?